Target's Obsessive Christmas Disorder sweater isn't sitting well with some of the people who actually have OCD. But the retailer isn't going to stop selling it. Target is selling a sweater that makes light of OCD, which isn't so funny to some of the people who actually have the disorder. 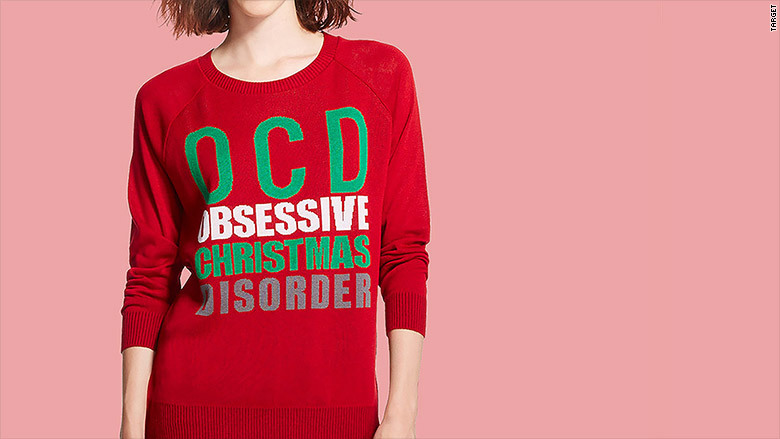 The red sweater is emblazoned with the acronym OCD, followed by the words "Obsessive Christmas Disorder." Customers who know that OCD actually stands for Obsessive Compulsive Disorder are demanding that Target take the sweater off its shelves and online store. "I'm calling on @Target to remove the #OCD sweater!" tweeted someone identifying herself as "the original #OCDiva." The issue lit up social media, with legions of the offended vowing that Target would get on their naughty list unless it got rid of the sweaters. But Target (TGT)won't do it. The outcry was large enough, however, to prompt Target to respond. "We never want to disappoint our guests and we apologize for any discomfort," said Target in a prepared statement. "We currently do not have plans to remove this sweater." OCD is no joke to the afflicted. The disorder causes "severe anxiety" and "involves both obsessions and compulsions that take a lot of time and get in the way of important activities the person values," according to the International OCD Foundation. But not everyone finds the OCD sweater offensive. "#goodgrief ppl are so uptight!" reads one tweet. "I have OCD & am fine w/this -- it's funny!" This is not the first time Target offended its customers with a marketing misstep. In 2013, the retailer labeled its plus-sized version of a dress Manatee Gray, though the non-plus version of the same dress was called Dark Heather Gray.